Mushrooms have been around forever, but did you know they pack a boost of brain power in every serving, which could mean the difference between cognitive troubles and maintaining a healthy brain well into your golden years? Consuming two or more servings of mushrooms weekly could slash the risk of mild cognitive impairment (MCI) by half. MCI is the stage right before dementia when things can turn sour during the natural ageing process. So exactly how many mushrooms make a difference? According to studies, one portion is about a third of a cup of mushrooms, and two servings constitutes about half a plate, and it wasn’t just one type of mushroom that produced benefits either. A compound called ergothioneine, only absorbed through diet, is a potent antioxidant and anti-inflammatory found in a variety of mushrooms that is believed to be the root of these benefits and many varieties help when it comes to improving focus and reducing brain fog. They have also been shown for their amazing gut healing abilities, incredible immune and healing support, and great cleansing powers when it comes to detoxing. Mushrooms are often used as a tasty addition to many meals without much thought given to their nutritional value. While fungi aren’t always the most appealing choice to everyone, mushrooms have been used for thousands of years in many cultures for their medicinal properties, and research is now starting to prove what people have known for years—mushrooms are one powerful superfood group. There are thousands of mushrooms in existence ranging from poisonous to psychedelic, but I would suggest you focus on the ones that are considered adaptogenic. These varieties support and bring balance to different areas of the body that are out of sync while also still being a great aid to your body’s regulator of detox and inflammation pathways. So next time you hit the supermarket, reach for these other next-level varieties to seriously elevate your health. Chaga – This mushroom is used as an anti-viral against flu and can rebalance the immune system. Lung brain and liver cancers have all been found to decrease with intake of chaga mushrooms. Cordyceps – If you are really looking for natural beauty support, look no further than cordyceps. This mushroom will act as your fountain of youth by increasing your anti-oxidants and decreasing lipid peroxidation activity and pro-inflammatory monoamine oxidase, which contribute to signs of ageing. Cordyceps also does wonders to rebalance hormones and help restore energy for those struggling with fatigue and exhaustion. Himematsutake – also known as Royal Sun Agaricus. This mushroom is a next-level cancer fighter and contains blazein, which is a specific protein shown in studies to kill cancer cells. This mushroom can begin to kill lung cancer cells after just three days and stomach cancer cells after just two days. Shiitake -Packed with B vitamins, shiitake mushrooms work to support brain health, good adrenal function and is a powerful cancer fighter. It has been shown to shrink tumours and has cholesterol lowering abilities. Reishi – Blood sugar issues are a serious problem in our society with diabetes on the rise. Ongoing blood sugar problems can also contribute to hormone imbalances, fatigue, weight loss resistance, chronic inflammation, and so much more. Focusing on a plant-based diet is one way to battle this epidemic, and mushrooms are a great nutrient-dense low carb option. 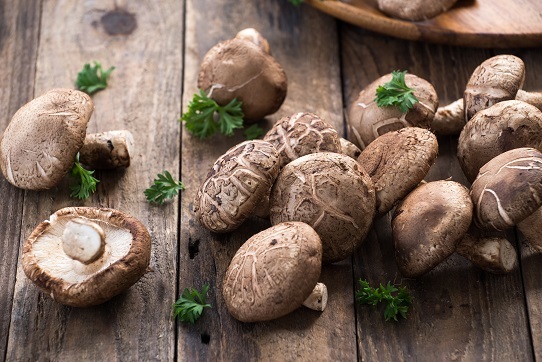 This mushroom has shown the ability to lower blood sugar in those diagnosed with diabetes as well as down-regulating alpha-glucosidase, the enzyme responsible for turning starch into sugar in the body. It can also help improve symptoms associated with diabetes such as kidney problems and wound healing. When buying whole mushrooms, it is essential to look for organically grown varieties as conventional mushrooms can be highly toxic due to the fact that mushrooms are extremely porous in nature and easily absorb pesticides and other chemicals. Depending what you have available to you in supermarkets and health shops, it may be more difficult to find organic versions of adaptogenic mushrooms since they are such a specialty item. You can buy dried mushrooms on line or buy an organic kit and grow your own. This is a great and inexpensive way to have healthy food at your fingertips. If you’re not a fan of the taste or texture of mushrooms, you can get these in powdered form, extracts, or in supplement form. Just like the whole food versions, you need to make sure these are organic. When you are in a hurry, powders are a great way to get your serving in of adaptogenic mushrooms for the day as they can be added to any beverage, smoothies, soups, or sprinkled on top of your favourite meals.